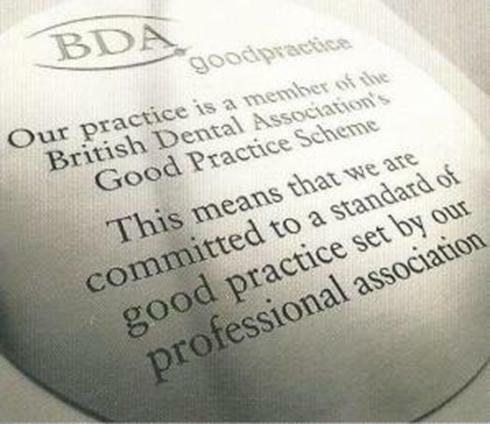 In 2004 we achieved the BDA Good Practice accreditation. The scheme offers dental practices a way to quality assure their service and to inform patients that they are committed to working to a high standard of good practice set by the profession's national association. In 2015 we gained the BDA Good Practice Scheme Gold membership. In 2009 our practice manager Karen was invited by The BDA to join their team and became a Good Practice Scheme Regional Consultant and Assessor. The Good Practice Scheme has become a trusted mark of quality and it depends on the whole dental team complying with standards of good practice. Our practice is a member of the British Dental Association Good Practice Scheme. This means we can aim to keep up-to-date with nationally agreed standards of good practice in order to provide the best care for our patients. We are assessed periodically throughout our membership to ensure our practice is meeting the Scheme requirements. Achieving the best possible outcomes for our patients depends upon the skills and professionalism of the whole dental team. Our dental team has made this commitment to your dental care. We are commited to supporting patients towards achieving and maintainig good oral health. 1. We will work with you to provide care that meets your needs and wishes. We wil explain what we are proposing to do and tell you about any significant risks. We will explain options and cost so that you can make an informed choice about your care and we keep all information about you confidential. 2. We look after your general health and safety whilst you are receiving dental care by undertaking risk assessments and managing any potential hazards at our premises. Infection control and cleanliness is also essential for safety and we follow current guidelines on preventing cross infection. 3. All of our staff are given training in practice procedures, staff members responsibilities are clear and staff take part in continuing professional education to keep their skills and knowledge up to date. 4. Our practice working methods are reviewed regularly and we ask patients for their views on our service in order to identify any opportunities for improvement.